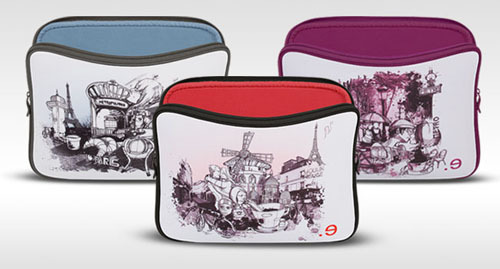 The Special Edition I Love Paris iPad, MacBook Cases by Be.ez are fashionable protective iPad cases and MacBook Pro cases. The Paris drawings created by French designer Mathieu Rivière celebrate the simple pleasure of life in Paris. The outside material is made of jersey fabric and the inside fleece lining protects your device from scratches. The cases come in sizes that fit the iPad, 13″ MacBook Pro and 15″ MacBook Pro.